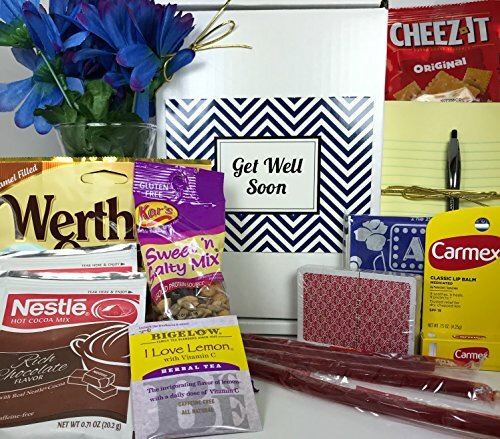 The message on the front of the box is a stylish "Get Well Soon" surrounded by a modern chevron design in navy blue. At Specialty Gift Boxes we choose the best gifts, so you don't have to. This gift box aims to please young and old with things that will help them feel better! We've handpicked items that should appeal to someone who is not feeling the best. Maybe you can't be with your friend or family member -- instead send your love, care, concern, and well wishes. And, by choosing Amazon's fast shipping, this box can be in their hands in only a day or two. Be sure to check out all of our other boxes suitable for a variety of occasions, like birthdays, holidays, anniversaries, sympathy, and congratulations (we even have boxes for dogs and cats)! All packed in a glossy, sturdy gift box with an elegant gold bow (no cheap basket or flimsy cellophane) -- no need for gift wrap! If you have any questions about this product by Specialty Gift Boxes, contact us by completing and submitting the form below. If you are looking for a specif part number, please include it with your message.